Update: We just heard back from Verizon, and they said that there will not be an update to unlock the bootloader on the device. The confusion with customer service reps has to do with a software update that will unlock GSM roaming, one of the scenarios we talked about last night. To be honest, it wouldn’t have made much sense for them to release a software update to unlock this device knowing that Samsung is selling a developer edition. 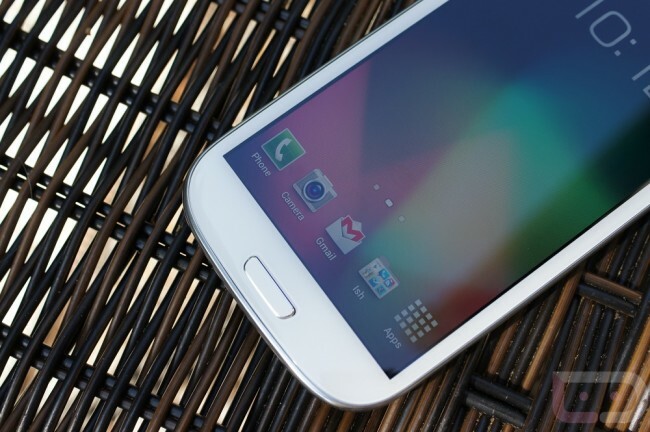 By now, you all know that the bootloader on Verizon’s Galaxy S3 is locked (signed), right? And you also probably know that Samsung has plans to release a developer edition that can be unlocked, only you have to fork out $599 to get it. Well, what if Big Red’s stance has changed, all of a sudden? Being the skeptics that we are, we emailed Verizon’s PR to see if this was true. While we have yet to receive official word back, we are seeing other signs that point to a software update as a possibility. My name is Levar and thank you for contacting Verizon Wireless about the boot loader for the Galaxy S3. I know this may be frustrating but there will be a solution soon coming. Samsung will be releasing a software update to unlock your device. Right now, we do not have a date for the release but it shall be soon. Verizon Wireless appreciates you as a customer and your patience in this matter. After seeing that email, we started hearing from other readers who were receiving similar responses. 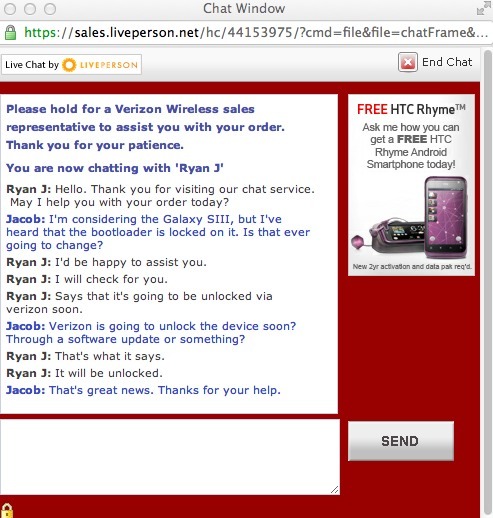 To make sure this wasn’t some giant conspiracy, I too jumped onto Verizon’s site and chatted with a sales rep. I asked as plain as day if the bootloader situation was ever going to change. The rep said “it’s going to be unlocked via Verizon soon.” It appears as if he checked into some sort of support system that mentioned an unlock update. To add to that, another reader went directly to Samsung to see if they could get a response. Below is a screenshot of that response, however, it’s a tad confusing. 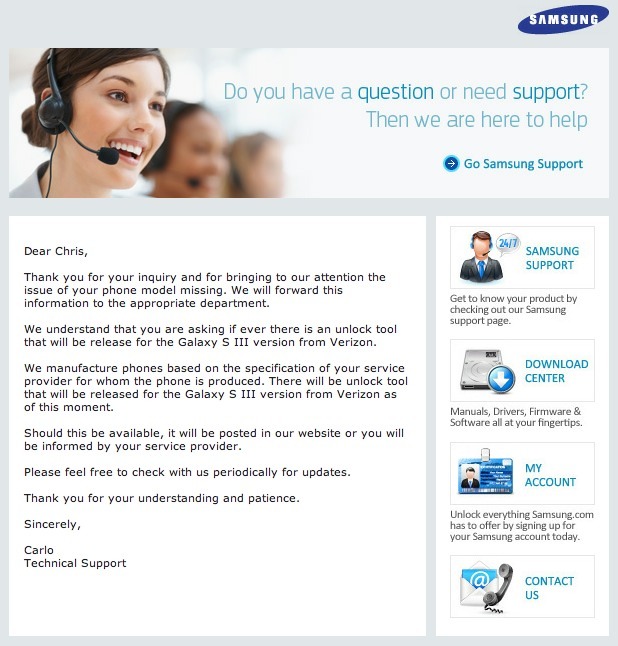 The important part reads “There will be unlock tool that will be released for the Galaxy S III version from Verizon as of this moment.” It seems like he forgot the word “not” since he ended with “as of this moment,” or there actually is an unlock tool coming. Tough to tell, you guys decide. As of now, we are under the impression that there may be a solution on the way. We aren’t sure if it’s simply poor communication about this “developer edition” of the phone, which technically hasn’t even been announced yet or if Verizon has approved a software update. Something is definitely going on, but until we hear back from Verizon with an official response, let’s try not to get too excited. Others are also under the impression that this has to do with a global unlock, so that you can take your phone overseas, and that reps are simply confused. Again, let’s wait until we hear something official.